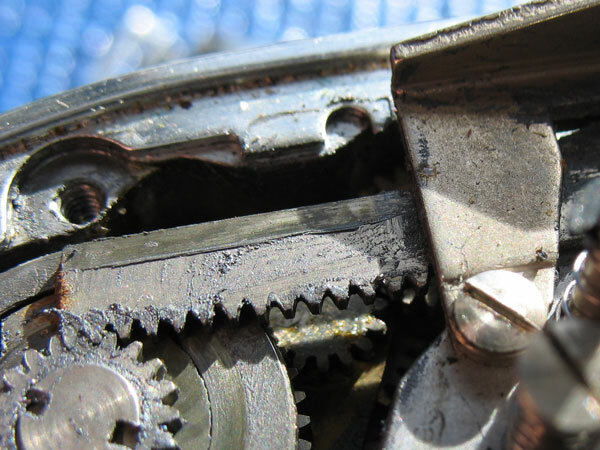 Having stripped off the over-burden, the repairs can take place. In this case I am stripping the film advance right down. 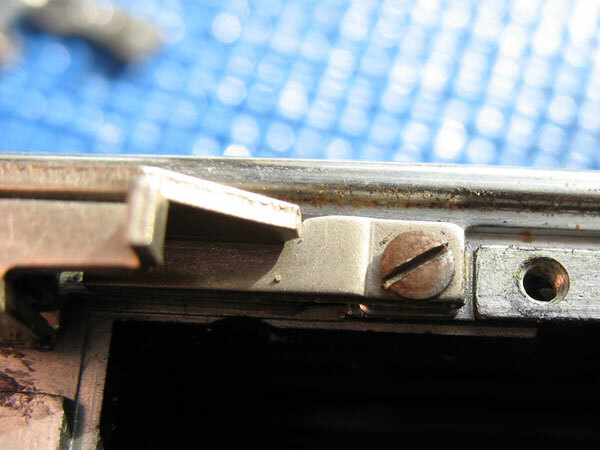 Start by removing the screws from the right-hand strap bracket. 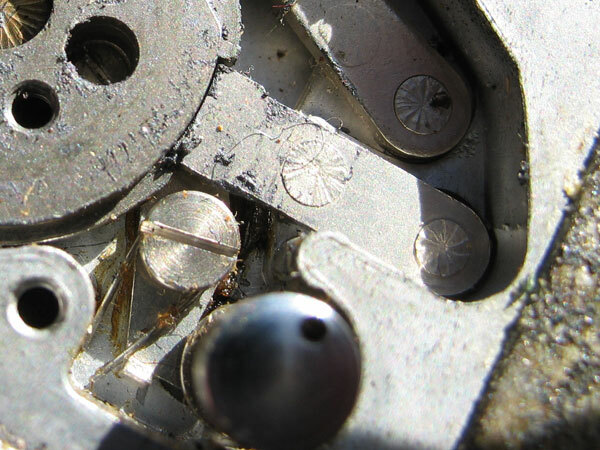 Note that the countersunk screw has a broad unthreaded section on its shaft, this serves to keep the rack support washer in alignment. 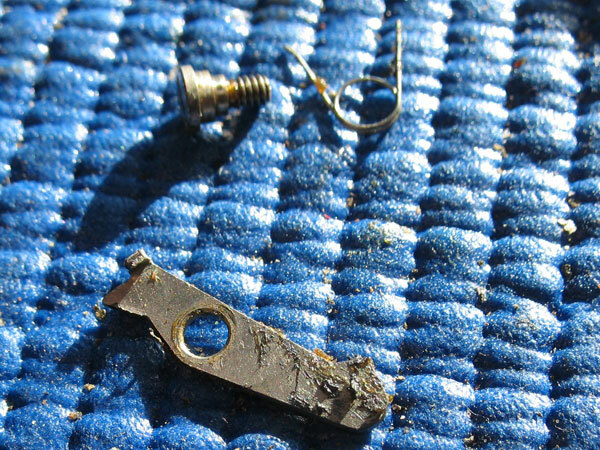 The rack support visible here, it is a thick, hardened washer. 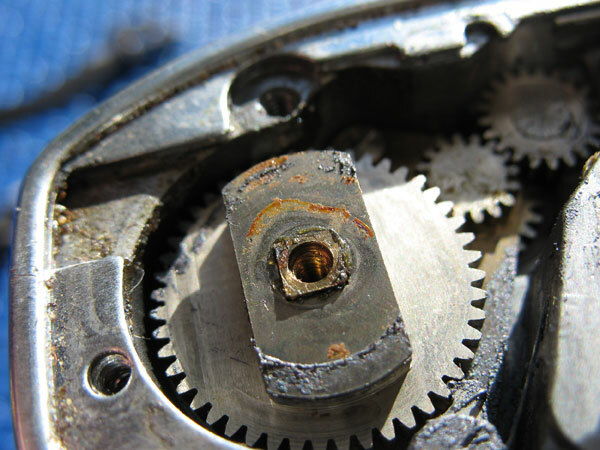 Note how it keeps the setting rack firmly in contact with the gear on the advance shaft. Lift it out and put it aside. Remove the screws from both ends of the rack bearing assembly, the bracket holding it down to the top of the camera body casting. Lift out the setting rack and inspect the teeth. They should be undistorted like the ones here. 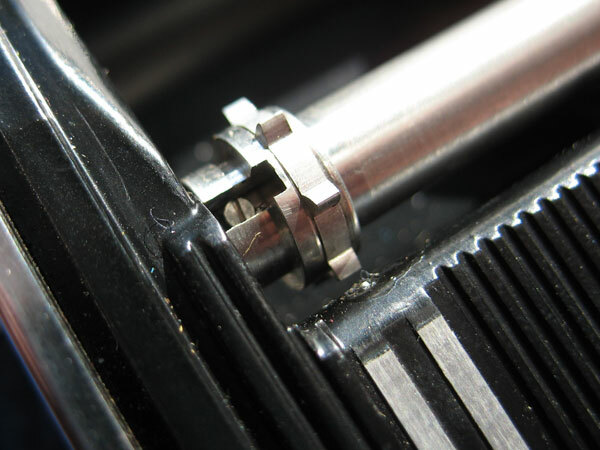 Remove the large central screw on the top of the film advance shaft. 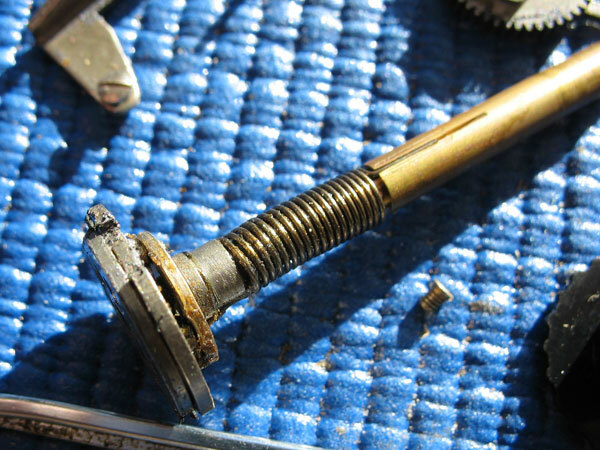 Lift off the screw, gear, washer, cam & spring. 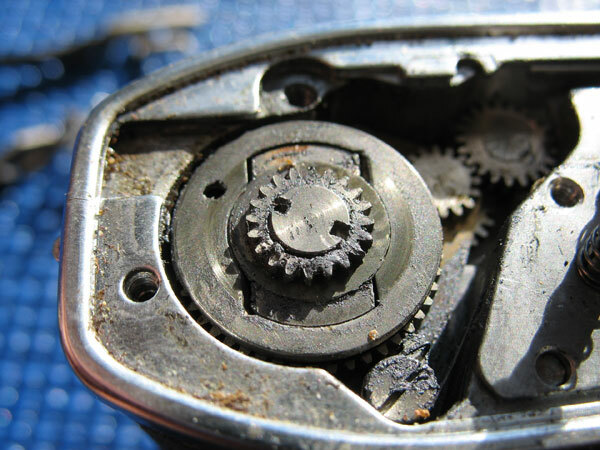 Remove the drive pawl and lift out the large gear. 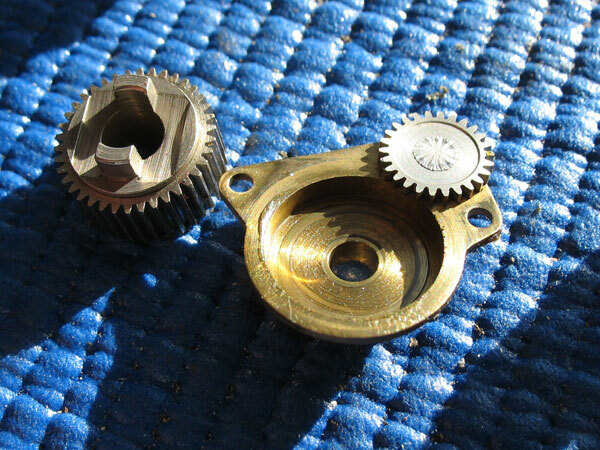 Remove both screws from bushing and gear assembly, and lift out the ratchet components. 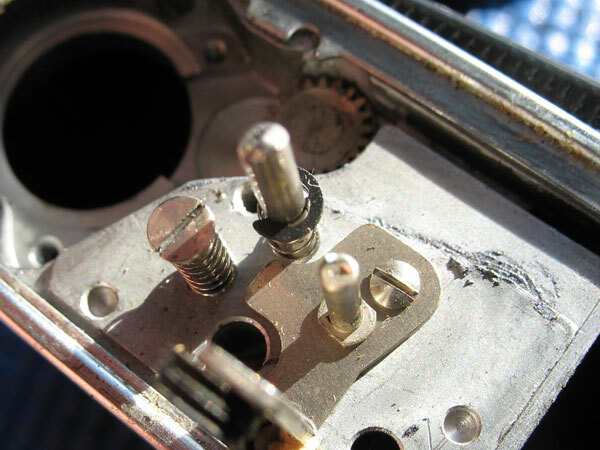 Turn over the camera and remove the three screws holding the film advance shaft assembly into the body casting. 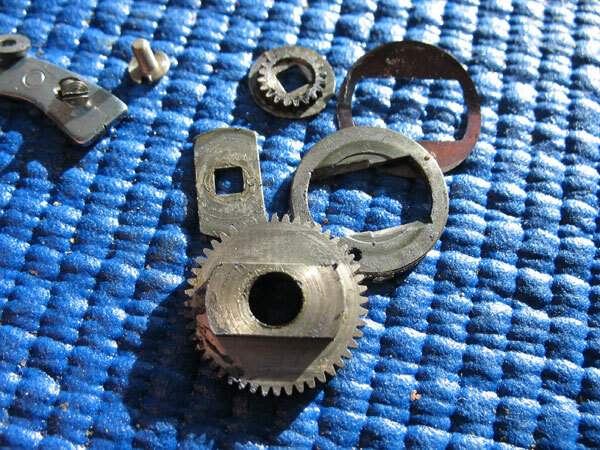 Lift out the advance shaft, the clutch assembly and the bushing and gear assembly may now just fall out of the body. 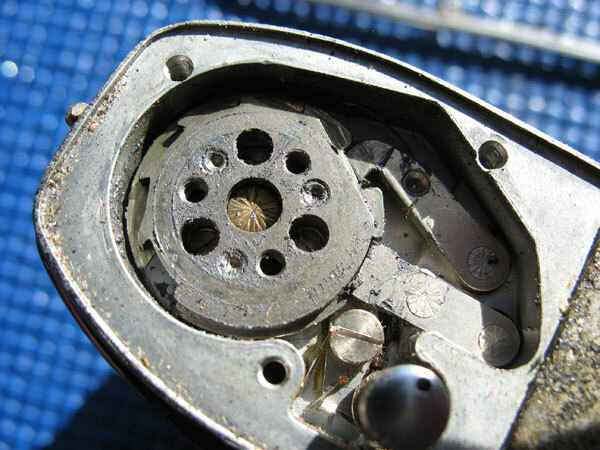 Remove the screw from the rewind catch and lift out the catch, the spring and their fixing screw. 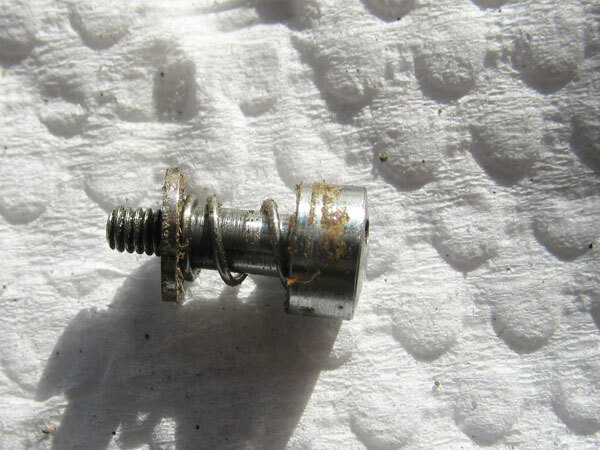 Remove the e-clip and screw from the top of the lock and release assemblies, and remove from the body casting. 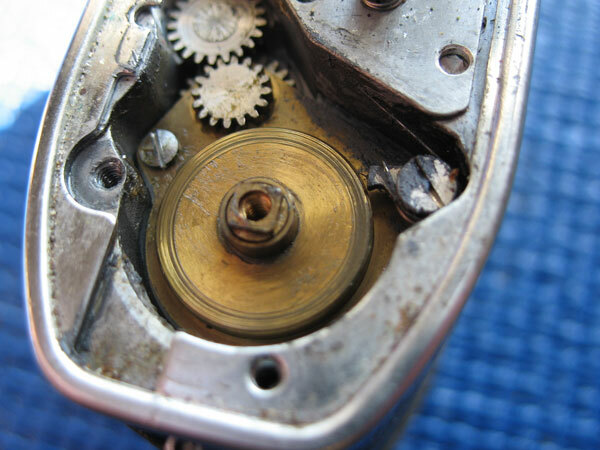 Unscrew the rewind button from the sprocket shaft, and lift out the button with its spring and washer. 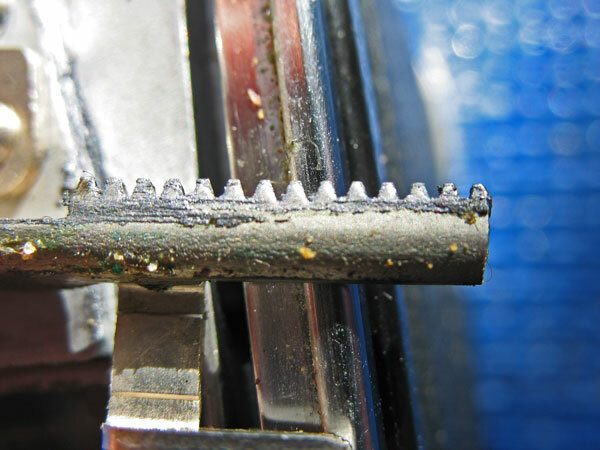 Remove the screw from the slot in the film sprocket and push the shaft up through the body. 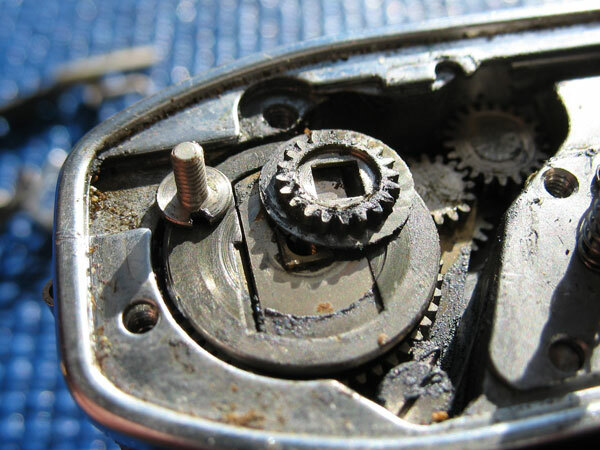 The body casting should now be cleaned of all traces of old grease, grit and those messy film chips and put aside for later assembly. 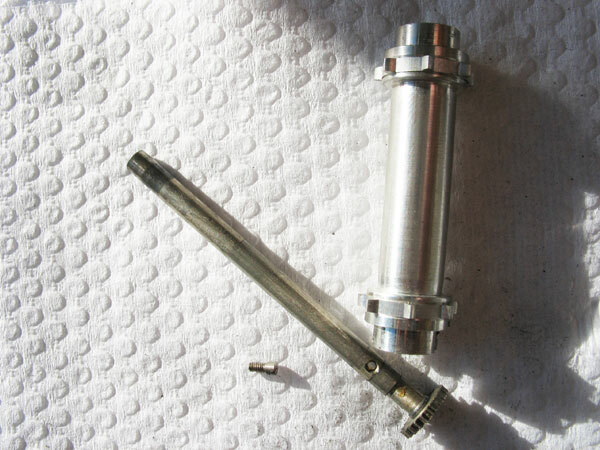 All the metal components can be cleaned in a suitable solvent, cigarette light fluid works fine, but be very careful not to let any come in contact with the plastic take-up spool. 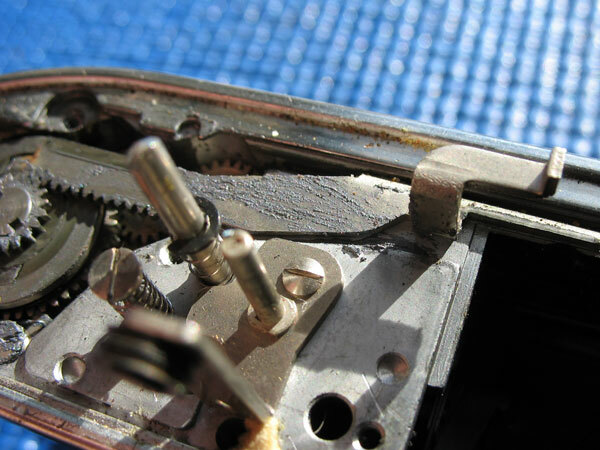 If the mirror and capping-plate levers and latch assemblies are working smoothly, then you can reassemble the film advance next, but if anything needs to be done to the mirror or its associated levers, this must be done before refitting the film advance mechanism. 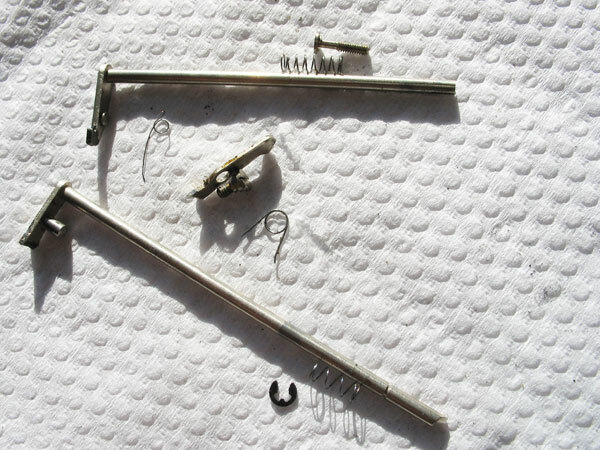 If the chrome trim on the body casting is grubby, now is the time to remove it for cleaning. 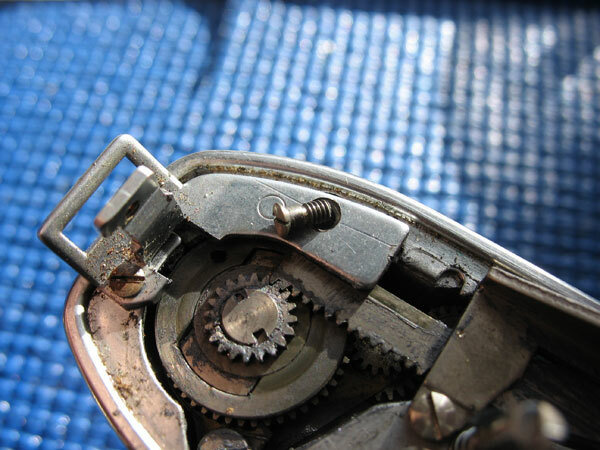 Just remove the two screws holding the left-hand strap-lug to the casting and lift off. 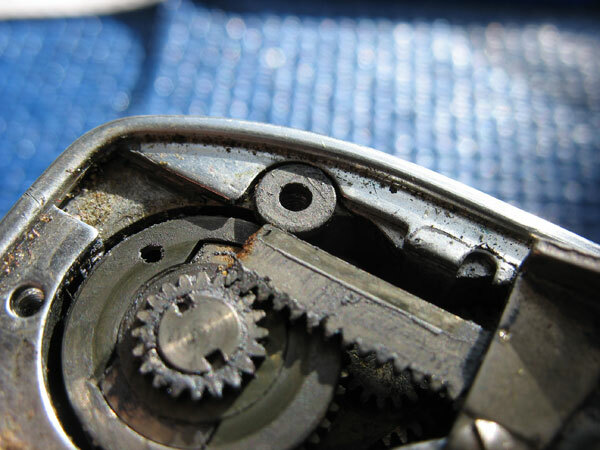 Next section: Reassembling the film advance mechanism.